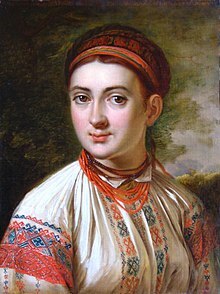 Vyshyvanka (Ukrainian: вишива́нка [ʋɪʃɪˈʋanka] or Ukrainian: виши́ванка [ʋɪˈʃɪʋanka]) is a colloquial name for the embroidered shirt in Ukrainian and Belarusian national costumes. 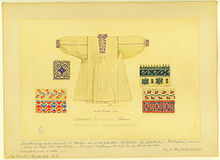 Ukrainian vyshyvanka is distinguished by local embroidery features specific to Ukrainian embroidery. Vyshyvanka is used as a talisman to protect the person wearing it and to tell a story. Embroidery was used in vulnerable places on the garment where evil spirits could potentially enter the body: along the neckline, cuffs, shoulders, back and hem. 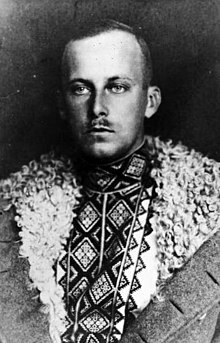 Archduke Wilhelm of Austria was a Ukrainian patriot who preferred wearing the vyshyvanka and was therefore known in Ukrainian as Vasyl Vyshyvanyi (Basil the Embroidered). The Vyshyvanoho Square was named in his honour in the city of Lviv. Vyshyvanka Day is celebrated on the third Thursday of May. It is intended to unite all Ukrainians over the world, regardless of religion, language they speak or their place of residence. It is a flash mob holiday, which is not attached to any public holiday or feast day. On this day many Ukrainians wear vyshyvankas to demonstrate adherence to the idea of national identity and unity and to show their patriotism. Officials, including municipal, court, and the government officials and the head of the state, may take part in celebration. [T]he word combination "Vyshyvanka Day" means the holiday dedicated to Ukrainian ethnic embroidered cloth and entered to Ukrainian culture as the name of a national holiday of Ukrainian consciousness, patriotism, and the spirit of unity of the people symbolized by Ukrainian vyshyvanka. During Paris Fashion Week 2015, Ukrainian fashion designer Vita Kin was featured in Vogue magazine and Harper's Bazaar for introducing vyshyvankas as modern Bohemian style designs that attracted fashion icons like Anna Dello Russo, Miroslava Duma, and Leandra Medine. In its US May issue Vogue wrote that the vyshyvanka has "made waves far past the Eastern European country". The Times of London declared it "this summer's  most sought-after item of clothing", soon following was the New York Times who advised readers to stock up on this "top of summer" fashion. French actress Melanie Thierry wore a vyshyvanka at the 2016 Cannes Film Festival. Queen Máxima of the Netherlands wore a vyshyvanka dress when visiting the 2016 Summer Olympics. 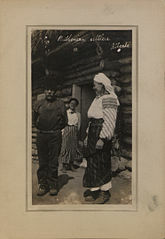 Ruthenian immigrants to Canada in 1911 in traditional garment. 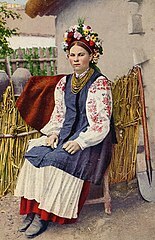 A postcard printed in 1916 featuring a Ukrainian peasant lady in vyshyvanka and traditional wreath. At vyshyvanka parade – a popular event in modern Ukraine. ^ "Ukrainian Language Dictionary" (in Ukrainian). Potebnia Institute of Linguistics. Retrieved 2019-02-25. ^ Karolina Koziura (Spring 2014). "Everyday Ethnicity in Chernivtsi, Western Ukraine". Anthropology of East Europe Review. Poland: Maria Curie-Sklodowska University. 32 (1). Archived from the original on 2014-06-04. Retrieved 2016-01-30. ^ a b c JJ Gurga (September 2012). Echoes of the Past: Ukrainian Poetic Cinema and the Experiential Ethnographic Mode (PDF) (Ph.D.). University College London (UCL). pp. 189–190. Archived (PDF) from the original on 2015-10-22. Retrieved 2016-01-30. ^ Elena Gapova (2017). "Things to Have for a Belarusian: Rebranding the Nation via Online Participation" (PDF). Studies in Russian, Eurasian and Central European New Media (digitalicons.org). Western Michigan University (17): 47–71. Archived (PDF) from the original on 2018-10-16. Retrieved 2019-02-25. ^ "Makei: Vyshyvanka is a national symbol for Belarusians". BelTA. 2017-06-23. Archived from the original on 2017-06-28. Retrieved 2019-02-25. ^ "Vyshyvanka to be artistic centerpiece of Independence Day celebrations in Belarus". BelTA. 2016-07-01. Archived from the original on 2016-07-03. Retrieved 2019-02-25. ^ "У Києві відкрилася виставка вишиванок з усієї України (Vyshyvanka exhibition in Kyiv)". 1TV. 2015-09-11. Archived from the original on 2015-09-25. Retrieved 2016-01-29. ^ Condra, Jill (2013). Encyclopedia of National Dress: Traditional Clothing Around the World. ABC-CLIO. p. 624. ISBN 978-0-313-37636-8. ^ Rena Darsania (2015-06-04). "Poltava celebrated the Day of vyshyvanka". PoltNTU press. Archived from the original on 2016-05-01. Retrieved 2016-05-01. ^ Information and Communication Department of the Secretariat of the CMU (2015-05-21). "Cabinet of Ministers Secretariat celebrates Vyshyvanka Day". Government portal. Archived from the original on 2016-01-29. Retrieved 2016-01-30. ^ "Deputy Minister of Information Policy Tetiana Popova Participates in Press Conference Dedicated to Vyshyvanka Day". Ministry of Information Policy of Ukraine. 2015-04-21. Archived from the original on 2016-01-29. Retrieved 2016-01-30. 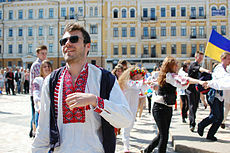 ^ "Our vyshyvanka unites the country - President during the flashmob on Vyshyvanka Day in Dnipro". Official website of the President of Ukraine. 2018-05-17. Archived from the original on 2018-09-13. Retrieved 2018-09-13. ^ "The Decision No. 1151 of the Ministry of Economic Development and Trade of Ukraine". 2018-08-17. Archived from the original on 2018-09-13. Retrieved 2018-09-13. ^ Liana Satenstein (Apr 28, 2015). "Your Favorite Bohemian Garb Is Actually Traditional Ukrainian Costume". Vogue. Retrieved 2015-04-28. ^ Tara Lamont-Djite (Apr 14, 2015). "We're Obsessed:Vita Kin Introduces The Perfect Bohemia". Harper's Bazaar. Retrieved 2015-04-14. ^ "DESIGNERS TO WATCH: Vyshyvankas by Vita Kin – Traditional Ukrainian Chic". Fashion For Fashionlovers. May 14, 2015. Archived from the original on May 29, 2015. Retrieved May 14, 2015. This page was last edited on 8 April 2019, at 08:34 (UTC).